Last week, I joined representatives from 14 different states in India to learn from experiences in bringing diverse sectors together to improve maternal and child nutrition in India. 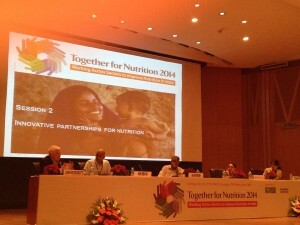 The two-day conference, Together for Nutrition, was organized by two exciting programs currently working across India, POSHAN and Transform Nutrition. 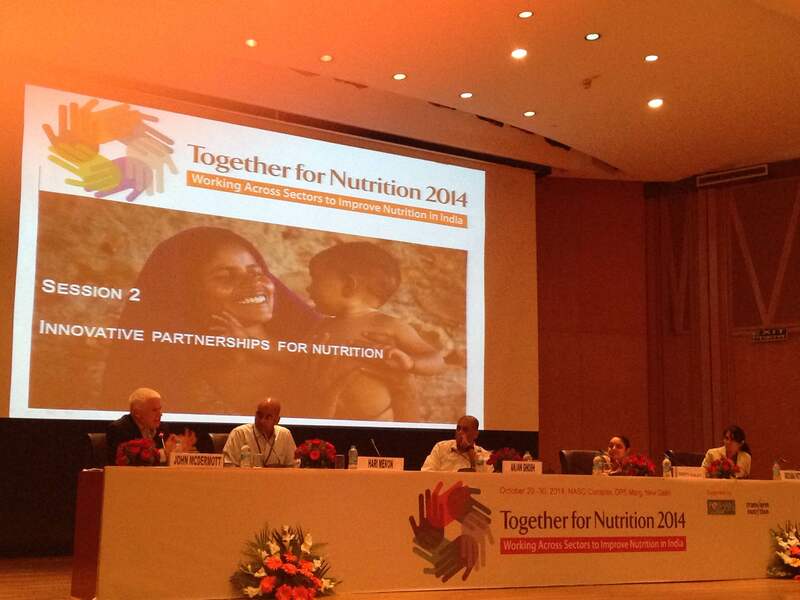 On the second day of the conference, I co-chaired a session called “Innovative Partnerships for Nutrition” with Hari Menon from the Bill and Melinda Gates Foundation in India. Three case studies were presented: a cell phone counselling intervention to encourage new mothers to use appropriate infant and young child feeding practices, a value chain improvement project to create an energy-dense, fortified food with locally available cereals; and a social business alliance to produce and market fortified foods. Both of these projects were improving foods that were part of the supplementary food rations distributed to young children and pregnant and lactating women through the Government of India’s Integrated Child and Development Services (ICDS) scheme. The case studies highlighted what I thought were three common ingredients in successful partnerships to deliver programs addressing nutrition and health at scale. In India, the national and state governments are making huge investments in nutrition and health, with employment programs, public food distribution, support to agricultural production of different crops, and nutrition and health programs. Leveraging these investments to better advantage is critical for achieving faster impacts at scale. Some examples of smart leveraging were presented. One example shared by Sadhana Bhagwat from the Global Alliance for Improved Nutrition (GAIN) – India, was leveraging state investment in infrastructure (e.g., manufacturing plants) to improve the production of a fortified food product. Another example, shared by Archana Patel, from the Lata Medical Research Foundation, described an evaluation of how telephone counsellors, supported by private telecoms companies, improved child nutrition and health outcomes linked with the maternity departments of public hospitals. The clear advantage of working across sectors is the synergies that can be achieved by combining different knowledge and “know-how.” Communities, private companies, and social enterprises, all have insights that can increase the likelihood of delivering cost-effective programs that can improve the well-being of vulnerable populations. Anjan Ghosh, from the Indian Institute of Management in Calcutta, started his presentation with the caveat that he was not a nutritionist. But his management background in supply chains and logistics helped identify both the bottlenecks and the entry points where improvements could be made that improved both the nutritional value of supplementary food rations and created entrepreneurial opportunities for actors in the value chain. In each of the cases presented, research institutes and think tanks had an important role as knowledge partners and as the links between the different partners. The Lata Medical Research Foundation provided the quality of evidence that public health requires for accepting a new intervention. GAIN and the Indian Institute of Management in Calcutta, provided expertise on business models and played a brokering role between the public and private sectors. On top of this, all three panelists said in their own way that in order for innovative partnerships to thrive there had to be three things in place. First, in order to guard against corruption, there had to be transparency and a trust relationship developed over time. Second, there had to be a quality product or service, reliably delivered. Finally, there needs to be a mutual understanding of what social good the partnership was trying to achieve, what population were being supported, and what outcome was desired. Partners needed to agree upon and commit to a common goal for real change to happen.